Jan & Tom Wightman create varied styles of Bespoke hand made jewellery to suit your requirements and lifestyle. We can advise with your choice of materials and stones, if needed, to ultimately achieve your ‘Forever Special’ piece. We make the Bespoke process simple from start to finish. Whether it is for a special life occasion, personal achievement or simply a well-deserved treat, your satisfaction is our aim! All of our Bespoke pieces carry their own story, as in the ones featured below. 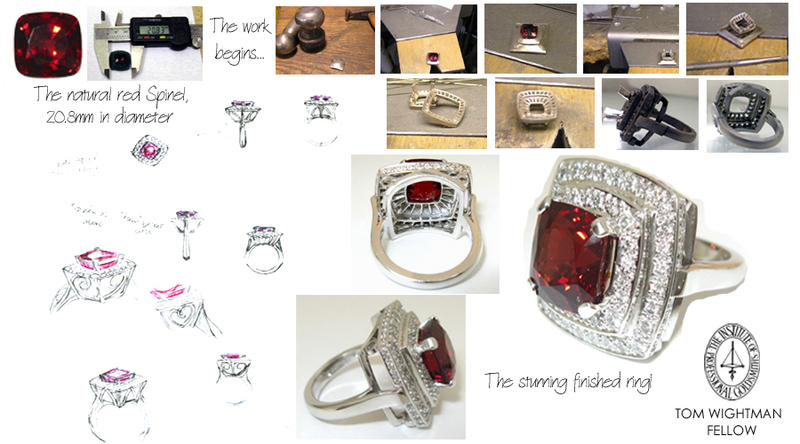 This client had purchased a very special large natural red Spinel with the intention of having an impressive ring made! As we have designed and made some beautiful jewellery for her in the past, she brought the stone in and asked us to design and hand make something that would ‘turn heads’! A challenge we relished. We produced a number of sketch designs with the specification of two rows of Diamonds around the stone and another row around the sides of the setting for extra sparkle! Tom hand made each piece of the mount from sheet and bar, checking the fit and position of the stones at each stage. The hand-cutting of the intricate detailing of the ‘back holes’ (to let light into the back of the stones), was done. The mount was assembled and checked for fit on the client’s finger and finally set with the stones. The resulting ring is spectacular, showcasing the Spinel at it’s absolute best, as well as the superlative craftsmanship of the mounting. It is indeed a very special and totally unique ring! Kisses Ring with Fine Diamond in Platinum & 18 carat Rose Gold. This client was bequeathed a gift of money by her mother and decided to have a beautiful ring Bespoke designed and made that would be a treasured keepsake. She wanted something different that she wouldn’t see everywhere. This style was chosen from a sheet of sketch designs created especially for her and a selection of beautiful Diamonds. The style was very appropriate, with a ‘kiss’ forming each shoulder. 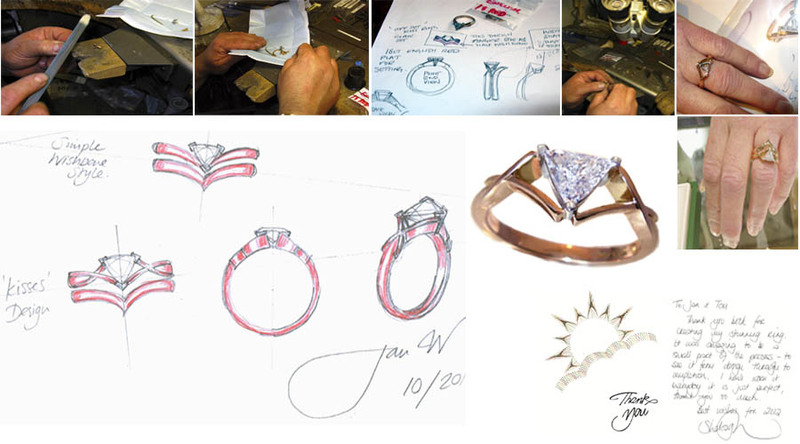 She saw the process of creating the ring from the chosen design and as it progressed through the various stages. Then finally the stunning finished ring, which we understand gives her so much pleasure every day. We were very pleased to create this beautiful ‘piece of memory’, which means so much to this lovely client. She was so thrilled that she made a beautiful hand stitched silk ‘Thank You’ card especially for us! Below is a section of the email she sent to us regarding the use of her ring pictures. Enjoying my ring? – it is still stunning and worn all day everyday. I can sit and look at it with the same feelings I had when I first saw the finished article, thank you so much for designing and making such a beautiful ring that gives me so much pleasure. I am very proud to wear it. I am looking forward to seeing your website and of course you can use photos of my ring and card plus the words written – it will be a privilege for me. Please call in, phone or email, to discuss your unique and personal Bespoke piece.